Hey, dude. Let's party! Surfboard Links set the right mood for capturing some tasty waves. 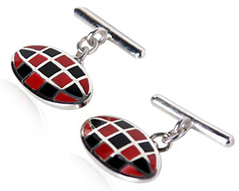 Our team of thinking outside the box designers have created a pair of cufflinks that present alternating enamel coated red and black squares on the shape of a sturdy surfboard. Enamel protects these cufflinks from the same thing that surfers crave: water. The shimmering rhodium silver mount contrasts nicely with a colorful surfboard fascia. Wear this pair of cufflinks with a surfer shirt or impress your colleague at work by adorning a starched dress shirt with a pair of surfboard cufflinks. I like the colors in these cufflinks. I also like that the colored part hangs from a chain this makes them different than most ordinary cufflinks.